This week it has been aubergines (Black Beauty) since you ask and Padron peppers. If you have haven’t tried growing these before, these are the classic Spanish tapas peppers. They are easy to grow but need to be started soon because with our cooler temperatures, they require a really long growing season. Once they are big enough to handle, put them first in three inch pots, and then pot them on into big pots or, as I do, into grow bags, with three plants to a bag. They start off little and green (which is when you pick them) and then, if you leave them, turn red. Be warned. For inexplicable reasons, one or two of every couple of dozen little green ones are ferociously hot. There is no way of telling them apart so it’s a bit like Russian Roulette. They also get hotter as the season progresses so that by August almost all of them are eye watering. Flash fry them in olive oil, sprinkle with sea salt – fantastic. I am very taken with Lachenalias. These are bulbs from South Africa. 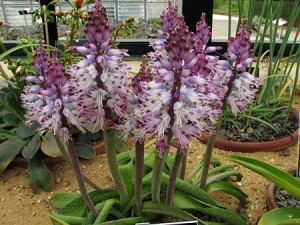 Lachenalia liliflora has glorious spotty leaves and stems and flower spikes that are a mass of translucent violet tubes each with a little natty white fringe of protruding stamens and I have been admiring them in the greenhouse whilst planting my seeds and fussing with my pelargoniums. Every couple of weeks I move the resting pelargoniums (well actually some of them haven’t been resting, it’s been so warm, they are getting all enthusiastic with leaf) around a bit and remove all the dead leaves. I am Mrs Messy indoors but in the greenhouse, I suddenly become Mrs V. Tidy – but that’s only because long experience has told me that messy things turn into mouldy things which then infect the whole greenhouse. But there’s one pelargonium that I leave outside all winter – astonishingly, even in our cold frosty garden, Pelargonium simonides ‘Pink Fizz’, a species pelargonium from South Africa which spreads through underground tubers – seems untroubled by cold. It’s more than you can say for me.